Racine, WI:: Whitman,, (1957.). Very good overall - slight delamination to the sides of the spine, usual toning to the pages.. First edition. Duotone illustrations by Sari. When Donna's mother has a chance to go with her husband on a business trip to India, Donna and Jimmy are left in the care of Jimmy's teacher. 282 pp. In the original glossy 'cello' or cellophane binding. Double page scenic endpapers. Wrap-around cover illustration of Donna leaving for a date and waving good-bye to her mother and young brother on the front porch. Condition: Very good overall - slight delamination to the sides of the spine, usual toning to the pages. 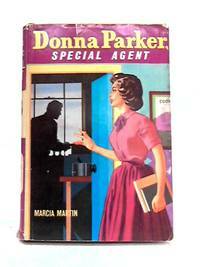 DONNA PARKER: SPECIAL AGENT. #2. Racine, WI:: Whitman,, (1957.). Near fine (gift inscription and usual toning to the pages, but the fragile binding is in much better than usual condition.). First edition. Duotone illustrations by Jon Nielsen. In this, the 2nd book in the series, Donna is in the 9th grade and joins the journalism club, as her interests and those of her friend Ricky begin to diverge. 282 pp. Book lists only to this title. In the original glossy celophane binding. Wis: Whitman, 1962. Very Good. Later. Very good. Board covers rubbed on spine, back cover, edges and corners, text edges browned. Please Note: This book has been transferred to Between the Covers from another database and might not be described to our usual standards. Please inquire for more detailed condition information. DONNA PARKER: MYSTERY AT ARAWAK.#6. Racine, WI:: Whitman,, (1962.). Very good condition - using toning to pages, slight wear to the fragile covers of cellophane over paper binding. Original format, lists through the 7th book in the series. Early printing. Duotone illustrations by Mary Stevens. In this 6th book in the series, Donna is a counselor at a girls' camp. Great cover illustration with campfire in background. Racine, WI:: Whitman,, (1957.). Good overall (usual toning to the pages, a little bit of delamination to the covers, but better than usual condition for this fragile binding.). Early printing. Duotone illustrations by Jon Nielsen. During the summer before her first year at high school, Donna works at a summer camp for special children. 282 pp. In the original glossy 'cello' or cellophane binding, wide format. DONNA PARKER: TAKES A GIANT STEP #7. Racine, WI:: Whitman,, 1964.. Very good,. Early printing. Duotone illustrations by Mary Stevens. In this book in the series, Donna enters high school, and learns that life - and people - are not all black and white, good and bad, but a mixture of both. Slightly smaller format than the earlier titles, matte illustrated covers. Racine, WI:: Whitman,, (1957.). Good condition (usual toning to the pages, bookplate, some delamination to the covers, but the fragile binding is in better than usual condition.). Early printing - cello binding. Duotone illustrations by Jon Nielsen. In this, the 2nd book in the series, Donna is in the 9th grade and joins the journalism club, as her interests and those of her friend Ricky begin to diverge. Lists to #6 in the series in the ad at the back of the book. 282 pp. Plaid endpapers, In the original glossy 'cello' or cellophane binding. Racine, WI:: Whitman,, (1957.). Good condition (usual toning to the pages, but the fragile binding is in much better than usual condition.). Early printing - cello binding. Duotone illustrations by Jon Nielsen. In this, the 2nd book in the series, Donna is in the 9th grade and joins the journalism club, as her interests and those of her friend Ricky begin to diverge. Lists to #7 in the series in the ad at the back of the book. 282 pp. Plaid endpapers, In the original glossy 'cello' or cellophane binding. Racine, WI:: Whitman,, (c 1960.). Very good+ ( usual toning to the pages). Later printing. Duotone illustrations by Sari. In this, the 4th book in the series, Donna is finishing the 9th grade and competing for a school prize, while her best friend Ricky's mother becomes sick and dies and the changes in Ricky's behavior threatens their friendship.. 282 pp. Late 1960's edition, still in the slightly wider format, but with new cover art and a semi-glossy finish. Windowpane design endpapers. Racine, WI:: Whitman,, 1964.. Good overall (usual toning to the pages, some soiling to the covers). Early printing. Duotone illustrations by Mary Stevens. In this book in the series, Donna enters high school, and learns that life - and people - are not all black and white, good and bad, but a mixture of both. Slightly smaller format than the earlier titles, matte illustrated covers. Racine, Wisconsin: Whitman Publishing Company. VG/NONE. 1960. Hardcover. Book is straight and clean with a laminated pictorial cover. The lamination is lifting some from the spine area and tape has been applied. There is slight wear to the edges, a previous owner's name is written on the front endpage and pages are age-browned. This is one in the series of Donna Parker adventure stories with tricolor illustrations throughout. ; B&W Illustrations; 7 3/4" x 5 1/2"; 282 pages . Racine, Wisconsin: Whitman Publishing Company. Very Good+ with no dust jacket. 1957. First Edition. Hardcover. Pictorial hard cover, very good , clean, tight copy, pages slightly browned with age. Great copy. Donna's and Ricky's interests begin to diverge as they begin ninth grade. While Ricky wants to join the drama club, Donna prefers to join the journalism club, which puts out the school newspaper, The Summerfield Sum-It-Up. She makes many new friends there, including the club advisor, Miss Fischer, but worries that she and Ricky are not as close as they used to be. She also runs afoul of several different people: Mr. Brown, the surly new janitor; Joyce Davenport, who is elected editor of the Sum-It-Up, and who thinks she "knows it all" because her father is the editor of the Summerfield Daily Bulletin; and Miss Merwood, the extremely eccentric cooking teacher. It is an exciting year as she helps the club compete in a journalism contest and becomes involved with encouraging people to vote in local elections. To compound her problems, her mother's youngest brother, Roger Norcross, who left home when he was in high school, suddenly returns. Donna doesn't know what to make of this man, and even has suspicions that he might not be her uncle. ; 8vo - over 7¾" - 9¾" tall; 282 pages . Racine, Wisc. : Whitman Publishing, 1962. 282pp Corners of cover are rubbed and tiny tears at top of spine, otherwise book is AS NEW. Probable First Edition. Glossy Hardback. Very Good. Illus. by Stevens, Mary. Whitman Publishing, 1960. Book. Very Good-. Illustrated Boards. 12mo - over 6¾ - 7¾" tall. Hardcover with glossy pictorial boards; no jacket. Very good minus condition: light wear; some laminate starting to peel; pages toned..
Racine, WI: Whitman Publishing Company, 1962 Book. Illus. by Stevens, Mary. Good +. Hardcover. Moderate age/use wear; an adequate reading copy..
Whitman. Used - Acceptable. Acceptable condition. Hinge cracked. Whitman. Used - Good. Good condition. Owner's name on endpage. Racine WI: Whitman. 1960. good+. Hardcover. glossy laminated color il'd cover; 282pp; 3-color il'd endpages; 2-color plates & decorations; lean to spine; pp browning; prev. owner's name in pencil free front & back endpages . Racine Wisconsin: Whitman Publishing Company, 1957. Minor stubbing to corners and spine.A few very small pieces of pictorial missing around edges.. Pictorial Cover. Fair. Illus. by Nielsen, Jon. 12mo - over 6¾" - 7¾" tall. Novel. western publishing 1957 Hardcover. Fair.